To be fair to the federal government, the MTA and other similar organizations have never made a public effort to push back on these mandates. The reason for this is that while the ADA mandate is unfunded, the federal government funds plenty of MTA programs that aren’t part of any federal mandate – where, in fact, it’s unclear why the federal government would be involved at all in a logical world. 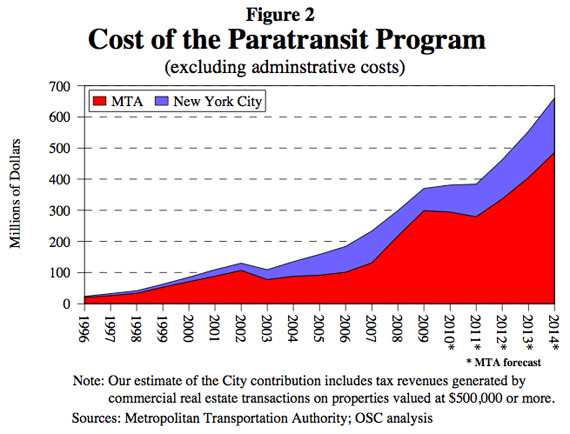 A world where the federal government funded its mandated programs only would be a world with billions less in federal money for the MTA. If all new taxis are wheelchair and scooter accessible, this might indeed save a lot of money on paratransit. It still doesn’t deal with the fact that there is no form of paratransit which gives an trip time close to a long subway trip, so the MTA really needs to start making its subway stations accessible faster. Do Access-a-Ride drivers customarily get tips? This could be an uncalculated hidden cost if it’s shifted to yellow cabs. Tips are probably included in the $15-per-ride average for a taxi cab, and even if they aren’t, riders won’t be given out tips great enough to cover the $34 gap between costs of providing services. True, but if the cab-driver sees a disabled person, they may think to themselves “lousy tipper” and go to pick up a different fare. If the MTA uses taxis for paratransit service, the drivers could NOT do what you described do to it being a federal violation of the ADA. The penelty would be quite serious & all drivers would be notified of this policy. So who cares if disabled passengers are bad tippers. It is far preferable then being sewed for a ADA violation. There is no such thing as an ADA violation or a TLC violation. You can never prove why the taxi driver didn’t stop. And to get rid of a TLC hearing, where the complaint/rider must show up in person to testify, is to file a motion that you will be out of the country for the hearing date. Do this every time, for years if need be until the rider gives up and the case is dismissed. I like that the MTA is thinking of ways to improve its efficiency, but who are the intended customers for this service? If they are ambulatory, what makes a taxi any more of an accommodation than mass transit? Keep in mind that those who for the most part use Access a Ride are not able to take transit for one reason or another. It could be cognitive, physical or even geographical. So my advice to you & others is be careful before passing judgement. Why should public transit provide door to door service? Why provide service to a building anyways? If the goal of paratransit service is to make “accessible” non-accessible public transit infrastruture, why don’t they only pick up passengers at non-accessible public transit infrastructure? If you take any cholesterol medication, you qualify for access-a-ride, by your doc writing you have a heart condition and can’t walk more than X feet to the nearest public transit subway/bus stop. The system is a scam. If your truly sick, get Social Security, private insurance, or medicaid to drive you around. If the city & MTA had bothered to try to make the subway system accessible, they could provide for such people by providing them with taxi rides to the nearest accessible (with-short-walks) station at source and from the nearest accessible station at destination. Combined with the allowable increased charges and increased time, this would pretty much eliminate all scammers from the system. I believe this is what certain other systems *do*. Of course, unlike every other city in the US, New York is not making a serious effort to make its subway stations accessible.